Q. Where can I find scholarly articles? Berkeley College Library's databases provide access to a wealth of scholarly materials. The scholarly articles can be found in a number of scholarly journals, also know as peer-review journals. "Scholarly articles or peer-reviewed articles are written by experts in academic or professional fields. They are excellent sources for finding out what has been studied or researched on a topic, as well as to find bibliographies that point to other relevant sources of information." A number of databases, such as Academic Search Premier, or modules of Proquest offers a search option by scholarly/peer-reviewed journals. When searching a database, look for the "checkbox" that limits the search to "scholarly/peer reviewed journals" only. 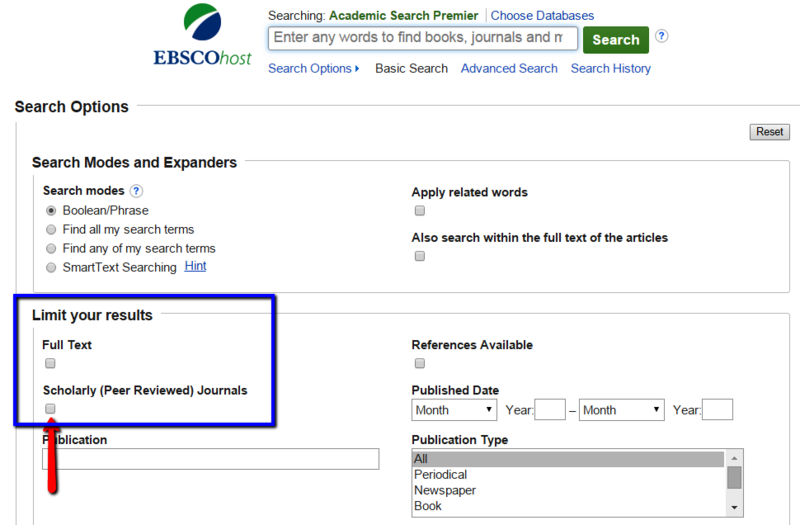 To search only scholarly materials, check off the "Scholarly Journals" and/or the "Peer Reviewed" checkboxes. For more information about scholarly journals check this video.